The Biosound Esaote MyLab 30CV combines advanced ultrasound technologies with portability and ease-of-use. The MyLab 30CV is designed as a high-end cardiovascular machine, but this system includes a range of technologies and features, making it adaptable to a wide range of ultrasound applications, including general imaging, abdominal, urology, and more. With a size just a little larger than a standard laptop, a 15-inch high-resolution TFT flat screen, and weighing just under 20 pounds, the MyLab 30V ultrasound highlights optimal interactivity during on-the-go situations. Especially when renting this ultrasound, operators can find continued benefits from its portability and shared service capabilities. In terms of its imaging, operators will have the possibility for quicker, more accurate diagnoses through the ultrasound’s range of imaging technologies, including Color Doppler, tissue harmonics imaging, and cine review. After scanning a patient, the integrated CD-RW drive and DICOM allow for incredible ease when viewing or distributing the ultrasound images. A unique feature of this system is its linear transducer that operates at up to 18MHz, ideal for rheumatology and other superficial imaging. With two transducer ports (somewhat rare among portable ultrasounds), operators can also optimize their system with integrated Stress Echo, laparoscopic, and TEE transesophageal transducers. 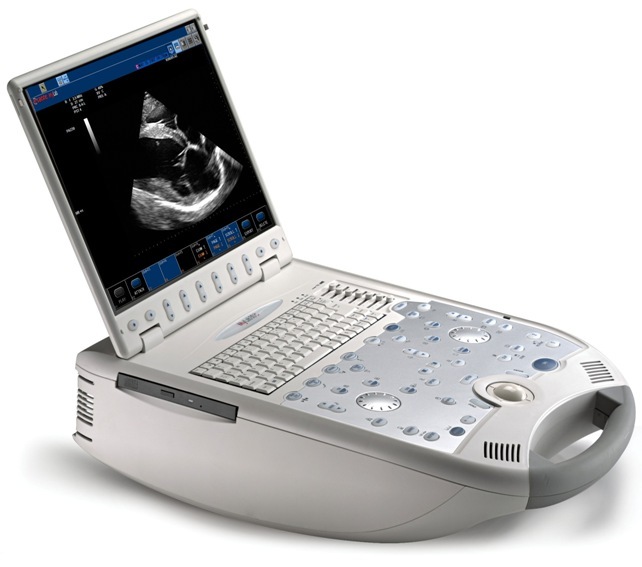 The cardiac imaging is very good, but for needle guidance procedures, rheumatology and other superficial imaging, the CV30 is one of the premium portable ultrasounds for sale.